After the quality of the Cartoon Network, traditionally animated Clone Wars, this CGI Movie seems to be a far departure. The original TV show was a mix of crazy animation with some great character and story development. This show feels like it is aimed squarely at the kids market, with little or no depth and a story which is, at best, silly. This becomes really apparent when the movie begins with an irritating voice-over, like something out of the 50s radio serials. Considering the series is famous for the scrolling text introductions, the narrator here seems poorly judged and strikes a bizarre tone to start the movie. From there the film shows some promise. A battle led by Obi-Wan Kenobi and Jedi Knight Anakin Skywalker, where they must find a way to destroy an enemy shield, seems like quite a creative way to introduce the characters in a new setting. There is even the added element of new character, Ahsoka Tano, Anakin’s new Padawan (Jedi in training). The way in which they finally do stop the shield generator is hardly inspired but it demonstrates some promise and keeps the interest. Unfortunately, the movie then seems to devolve into a childish, action-focused, story-less mess. Anakin and his new Padawan must rescue Jabba the Hutt’s son from Count Dooku who is using him to frame the Jedi and turn the Hutts against them. A good start but hardly the most thrilling of premises. Unfortunately, it hardly improves from here and what we get is a very protracted rescue mission that seems to take ages to make any progress. It doesn’t help that the “son” is a baby and the show becomes focused on toilet humour and squabbles between it’s two main characters. What starts as a promising relationship becomes annoying and the less Ahsoka talks the better. The way she calls Anakin “Sky-Guy” makes me shudder everytime. The saving grace for the movie is that it doesn’t relent on the action. Space fights, lightsaber duels and pitched battles all feature and do look great. The animation doesn’t always hold-up and considering the distinct style that the original Cartoon Network series had, this feels too generic (although they seemed to have designed the characters in exactly the same way). The dodgy animation becomes apparent whenever any character just walks. It doesn’t ever really look right. As for character design, Count Dooku is bizarrely designed and the less said about the squashed Yoda the better. There are some moments of genius though, one being the continued inclusion of Sith apprentice Ventress, who was one of the better characters from the original series. It is clear that this “movie” is an extended pilot for a bigger series. It has a poorly resolved story which doesn’t really add the gravitas and excitement that you’d want from a Star Wars film, even an animated tie-in. Viewing it as a two-part episode for a show, it does offer some reprieve but considering it is marketed as a movie, it is a poor addition to the ongoing saga. 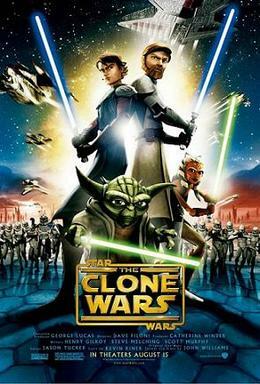 Overall, Star Wars: The Clone Wars is a poor cousin to the main story. It has a silly story, annoying new characters, strange animation and design and a very irritating narrator. There are some signs of promise and as a pilot for a TV show it works slightly better but as a film in the Star Wars Universe, it is best forgotten.